Background: Using a metered-dose inhaler (MDI) beyond the labeled number of actuations may result in inadequate dosing of medication, which can lead to poor clinical outcomes. This study compared respiratory-related emergency department (ED) visit rates in patients with asthma, chronic obstructive pulmonary disease, or both when they used albuterol MDIs with versus without dose counters. Methods: This retrospective study used US claims data to identify patients (ages 4–64 years) with asthma, chronic obstructive pulmonary disease, or both, using albuterol MDIs with or without an integrated dose counter. The study comprised a 1-year baseline period for patient characterization and confounder definition and a 1-year outcome period following the first albuterol prescription. The primary end point was the incidence rate of respiratory-related ED visits, compared using a reduced zero-inflated Poisson regression model. We also compared severe exacerbation rates and rescue medication use. Results: A total of 93,980 patients were studied, including 67,251 (72%) in the dose counter cohort and 26,729 (28%) in the non-dose-counter cohort. The cohorts were broadly similar at baseline (55,069 [59%] female patients; median age, 37 years). The incidence rate of respiratory-related ED visits during the outcome year was 45% lower in the dose counter cohort than in the non-dose-counter cohort (adjusted rate ratio: 0.55; 95% confidence interval: 0.47–0.64). Exacerbation rates and short-acting β-agonist use were similar between cohorts. Conclusion: These findings suggest that dose counter integration into albuterol MDIs is associated with decreased ED visit rates. The presence of integrated dose counters on rescue inhalers can help patients avoid using an empty or near-empty inhaler during exacerbations, thereby ensuring available medication for relief of their symptoms. Integrated dose counters on rescue MDIs could represent a simple and effective tool to improve clinical outcomes during exacerbations, with a potential for cost savings to health care systems. This retrospective database analysis using claims data was designed to investigate the impact of integrated dose counter albuterol inhalers on the incidence of respiratory-related ED visits among patients with asthma, COPD, or both. We hypothesized that the dose information provided by an integrated dose counter could lead to a reduction in the number of respiratory-related ED visits by decreasing the use of empty or near-empty canisters. Data for this study were extracted from the Clinformatics™ Data Mart retrospective claims database (OptumInsight Life Sciences, Eden Prairie, MN, USA), which includes anonymized data from an employed, commercially insured United States population, and collected between January 2006 and September 2012. Recorded data include medical claims (primary care and secondary care), pharmacy claims, and laboratory test results. 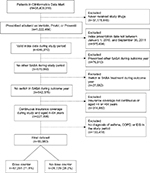 The study comprised a 1-year baseline period for patient characterization and confounder definition and 1-year outcome period for the effectiveness evaluation, with an index date defined as the date of the first prescription for albuterol (Figure 1). The study data were de-identified, thus written informed consent was not possible, and ethics committee review was not sought or deemed necessary by the authors. Abbreviations: COPD, chronic obstructive pulmonary disease; SABA, short-acting β-agonist; HFA, hydrofluoroalkane. Included patients were aged 4–64 years at the index date and had a diagnosis of asthma and/or COPD and/or exercise-induced bronchoconstriction recorded at any time and at least one prescription for albuterol. All patients had a first recorded prescription for albuterol (index date) between January 1, 2010, and September 30, 2011, and continuous insurance coverage during the study period. Patients prescribed Ventolin® HFA (GlaxoSmithKline Inc., Research Triangle Park, NC, USA) were assigned to the dose counter cohort; and patients prescribed ProAir® HFA (Teva Respiratory LLC, Horsham, PA, USA) or Proventil® HFA (Merck & Co., Inc., Whitehouse Station, NJ, USA) were assigned to the non-dose-counter cohort. Each of these inhalers delivers 108 μg of albuterol sulfate (90 μg of albuterol base) from the mouthpiece per actuation. Both the fine-particle mass and the plume vary only slightly among the three different inhalers and are monitored by the manufacturer and the US Food and Drug Administration as part of the product’s commercial release. The exclusion criteria were use of ProAir® HFA (Teva Respiratory LLC) or Proventil® HFA (Merck & Co., Inc.) (for the dose counter cohort) or the use of Ventolin HFA® (GlaxoSmithKline Inc.) (for the non-dose-counter cohort) during the outcome period and the use of any other SABA during the study period (all patients). The asthma subpopulation was defined as patients who had at least one consultation, inpatient admission, or ED visit for asthma recorded at any time during the study period; the COPD subpopulation was defined as those who had at least one consultation, inpatient admission, or ED visit for COPD recorded at any time during the study period. The concomitant asthma and COPD subpopulation was defined as those patients having at least one consultation, inpatient admission, or ED visit for asthma and COPD and/or codiagnoses recorded at any time during the study period. We did not examine results separately for the subpopulation with exercise-induced bronchoconstriction. The primary end point was the incidence rate of respiratory-related ED visits, defined as ED visits associated with a lower respiratory diagnostic code. Secondary end points for patients with asthma were the incidence rate of severe exacerbations (defined as respiratory-related inpatient admissions/ED visits or initiation of acute oral corticosteroids16) and rate of acute respiratory events (defined as occurrence of respiratory-related inpatient admission/ED visits or acute use of oral corticosteroids or antibiotics prescribed following a general practitioner visit for lower respiratory tract infection). For patients with COPD, exacerbations were defined as occurrence of respiratory-related inpatient admission/ED visits or acute use of oral corticosteroids or antibiotics prescribed following a general practitioner visit for lower respiratory tract infection. Additional end points included the average daily SABA dose and the probability of achieving asthma control (asthma subpopulation only) as risk-domain asthma control (defined as absence of acute respiratory events) and overall asthma control (defined as risk-domain asthma control and average daily albuterol dose ≤180 µg). Data were prepared for analysis by investigating outliers and the type and reason for missing data; skewed data were categorized if appropriate. Because of outliers, all patients with >10 ED visits were assigned a value of 10. No imputation was made for missing values. We evaluated potential confounders, including those that were significantly different at baseline (independent sample t-Test, Mann–Whitney U-Test, χ2 test, P<0.10) and baseline predictors of outcomes (full multivariable model, P≤0.05). Collinearity analysis of confounders (Spearman’s correlation coefficients, ρ>0.3) was performed. A multivariable model was used with stepwise reduction to derive the best-fitting model of noncollinear predictors (P<0.05). The incidence rate of ED visits was calculated using a reduced zero-inflated Poisson regression model. Exacerbation rates were compared using a reduced zero-inflated Poisson regression model, and the odds of achieving asthma control were analyzed using a logistic regression model. Average daily SABA use was analyzed using a reduced ordinal logistic regression model to determine the odds ratio (OR) for a higher categorized daily dose compared with a lower categorized daily dose (≤100, 101–200, 201–400, 401–800, or ≥800 µg albuterol). Subanalyses were performed for patients with asthma only, COPD only, or concomitant asthma and COPD because of differences in prescribing indications and outcomes definitions. A total of 93,980 patients ages 4–64 years were included in the study (dose counter albuterol cohort: n=67,251 [72%]; non-dose-counter albuterol cohort: n=26,729 [28%]) (Figure 2). 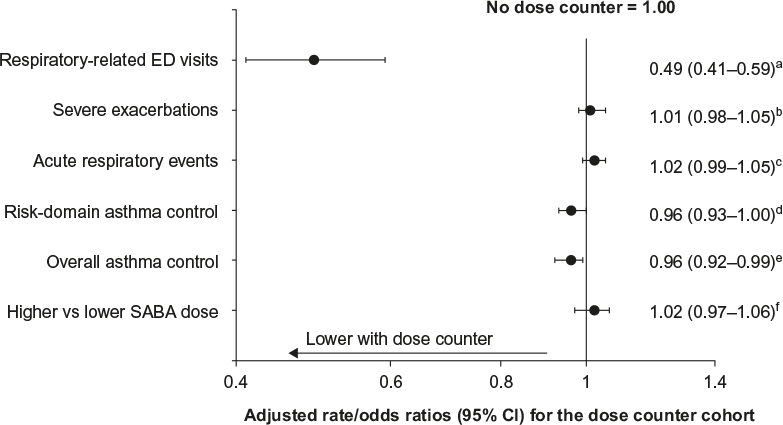 The dose counter and non-dose-counter cohorts were broadly similar at baseline (Table 1). Figure 2 Flow diagram of the patient selection process. Abbreviations: COPD, chronic obstructive pulmonary disease; EIB, exercise-induced bronchoconstriction; SABA, short-acting β-agonist. Notes: aP≤0.001 for comparison with dose counter cohort (Mann–Whitney or χ2 test). bPresence of GP visits in the study period (2009–2012). cP<0.05 for comparison with dose counter cohort (Mann–Whitney or χ2 test). Abbreviations: COPD, chronic obstructive pulmonary disease; GERD, gastroesophageal reflux disease; GP, general practice; IQR, interquartile range; NSAIDs, nonsteroidal anti-inflammatory drugs. During the outcome period, 341 (0.5%) patients in the dose counter cohort overall had a respiratory-related ED visit, a significantly smaller proportion than in the non-dose-counter cohort (304 [1.1%]; P<0.001 for the comparison; Table 2). The adjusted rate ratio (RR) for respiratory-related ED visits, relative to the non-dose-counter cohort, was 0.55 (95% confidence interval [CI]: 0.47–0.65; adjusted for baseline respiratory-related ED visits, respiratory-related inpatient admissions, and asthma consultations; gastroesophageal reflux disease diagnosis, rhinitis diagnosis, short-acting muscarinic antagonist use, and β-blocker use). Abbreviations: COPD, chronic obstructive pulmonary disease; ED, emergency department. A total of 75,787 (81%) patients had a diagnosis of asthma, including 53,964 (80%) of those in the dose counter cohort and 21,823 (82%) of those in the non-dose-counter cohort (Table 1). The treatment cohorts were comparable at baseline in terms of demographic characteristics, comorbidities, and medication use; a statistically significant difference in median age was not clinically significant (Table 1). Respiratory-related ED visits were recorded during the outcome period for 270 (0.5%) and 244 (1.1%) patients with asthma in the dose counter and non-dose-counter cohorts, respectively (P<0.001; Table 2). Those in the dose counter cohort had 51% lower incidence of respiratory-related ED visits (adjusted RR: 0.49; 95% CI: 0.41–0.59) (Table 2, Figure 3). Average daily SABA dose, severe exacerbation rates, and acute respiratory event rates were similar between treatment cohorts (Tables 3 and 4, Figure 3). 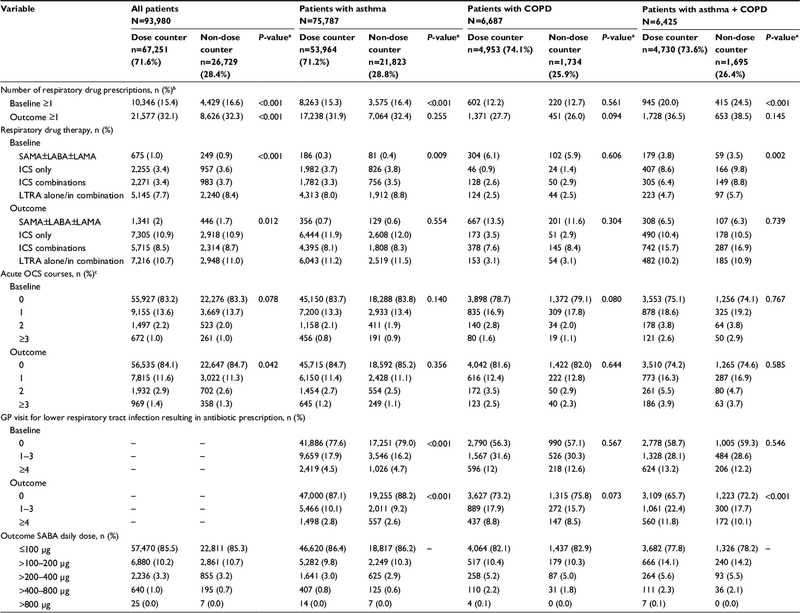 However, corresponding with the higher number of ambulatory visits resulting in antibiotic prescriptions (Table 3), patients with asthma in the dose counter cohort had 4% lower odds of achieving risk-domain or overall asthma control than those in the non-dose-counter cohort (Table 4, Figure 3). Notes: aχ2 test; bnumber of prescriptions for ICS, LABA, ICS+LABA, LTRA, LAMA, or SAMA; cprescriptions with dose >10 µg or with dose ≤10 µg but strength ≥5 µg and a same-day general practice visit for lower respiratory tract infection. Abbreviations: COPD, chronic obstructive pulmonary disease; GP, general practice; ICS, inhaled corticosteroid; LABA, long-acting β-agonist; LAMA, long-acting muscarinic antagonist; LTRA, leukotriene receptor antagonist; OCS, oral corticosteroid; SABA, short-acting β-agonist; SAMA, short-acting muscarinic antagonist. Note: There were no significant differences between cohorts (χ2 test). Abbreviations: COPD, chronic obstructive pulmonary disease; N/A, not applicable. Figure 3 Adjusted outcome measures for study end points over 1 year after the index date for patients with asthma. Notes: The non-dose-counter cohort is the comparator, with adjusted risk ratio/odds ratio set at 1.0. Adjusted for the following baseline variables: aSevere exacerbations, asthma consultations, ischemic heart disease diagnosis, acetaminophen use. bSevere exacerbations, age, gastroesophageal reflux disease diagnosis, acetaminophen use. cAcute oral corticosteroid courses, antibiotics prescribed at lower respiratory consultation, asthma consultations. dAntibiotics prescribed at lower respiratory consultation, acute oral corticosteroid courses, gastroesophageal reflux disease diagnosis. eAge. fAge, respiratory prescriptions, antibiotics prescribed at lower respiratory consultation. A total of 6,687 (7%) patients had COPD, including 4,953 (74%) in the dose counter cohort and 1,734 (26%) in the non-dose-counter cohort (Table 1). The treatment cohorts were comparable for patients with COPD with regard to demographic characteristics, comorbidities, and therapy. Respiratory-related ED visits were recorded during the outcome period for 16 (0.3%) and 23 (1.3%) patients with COPD in the dose counter and non-dose-counter cohorts, respectively (P<0.001; Table 2). Patients with COPD in the dose counter cohort had 60% lower adjusted respiratory-related ED visit rates versus patients in the non-dose-counter cohort (adjusted RR: 0.40; 95% CI: 0.22–0.75) (Table 2). Other COPD outcomes were comparable between cohorts, including COPD exacerbation rates (adjusted RR: 1.05; 95% CI: 0.97–1.13) and average daily SABA dose (adjusted OR: 1.08; 95% CI: 0.94–1.25) (Table 4). 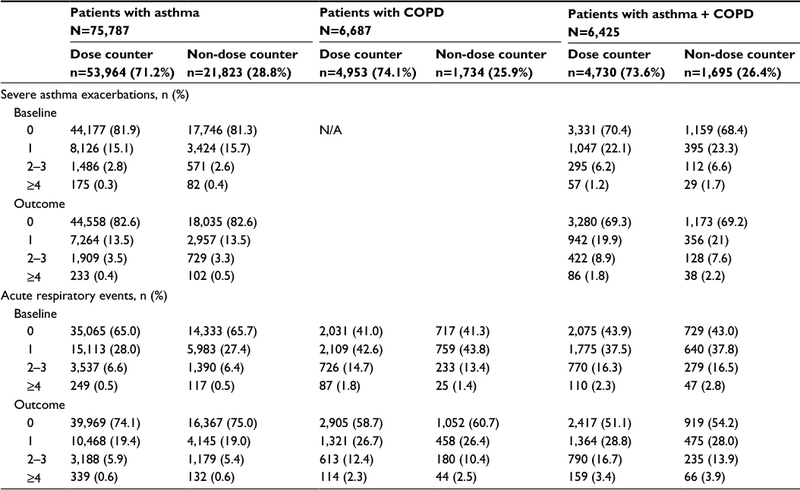 A total of 6,425 (7%) patients had a codiagnosis of asthma and COPD, including 4,730 (7%) of those in the dose counter cohort and 1,695 (6%) of those in the non-dose-counter cohort (Table 1). The treatment cohorts were comparable with regard to demographic characteristics, comorbidities, and therapy. There was no significant difference between the two cohorts in the unadjusted rate of outcome respiratory-related ED visit rates for patients with asthma and COPD (reported for 42 [0.9%] and 23 [1.4%] in dose counter and non-dose-counter cohorts, respectively; P=0.058; Table 2. The adjusted RR was 0.70 (95% CI: 0.43–1.16). 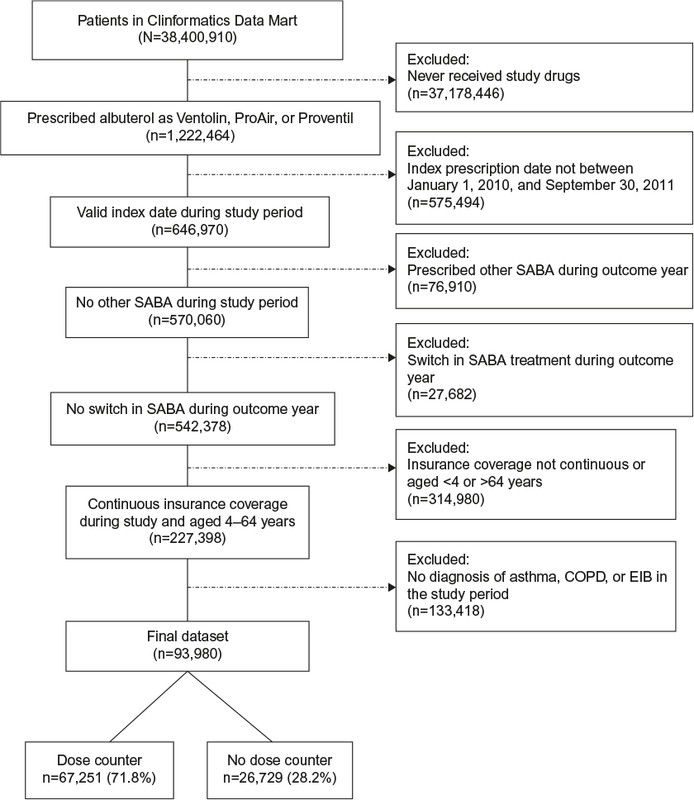 Outcomes were comparable between treatment cohorts in terms of exacerbation rates (adjusted RR: 1.06 [0.97–1.16]) and average daily SABA dose (adjusted OR: 1.05; 95% CI: 0.92–1.20; Table 4). In this investigation of the impact of an integrated dose counter in albuterol inhalers, the incidence rate of respiratory-related ED visits during the outcome year was estimated to be 45% lower in the dose counter cohort than in the non-dose-counter cohort. This result remained significant after splitting the population by single diagnosis: a 51% lower incidence rate was seen in patients with asthma and a 60% lower rate in those with COPD. There was no statistically significant difference in ED visit incidence rate between cohorts for the small subpopulation of patients with codiagnosis of asthma and COPD. Using a dose counter device was not associated with changes in indicators of disease control, including average daily SABA dose, which was not significantly different between the dose counter and non-dose-counter cohorts, for either the overall population or the subpopulations. We can speculate that the lack of difference in exacerbations may be because ED visits were relatively low in number as compared with the other components of the composite exacerbation variables, which included inpatient admissions and oral corticosteroid courses in the case of asthma exacerbations, and also antibiotics prescribed following a general practitioner visit for lower respiratory tract infection in the case of COPD exacerbations. Moreover, patients in the dose counter cohort of the asthma subpopulation had 4% lower odds of achieving overall asthma control in the outcome period. This was because they had a higher number of ambulatory visits for lower respiratory tract infections with antibiotic prescriptions, a component of the composite asthma control measures. We have no certain explanation for the latter finding. An important limitation of this study is the nonrandom treatment assignment, an issue common to all observational studies.21,22 Although adjustment for potential confounders was performed wherever feasible, there remains the possibility of unrecognized bias or confounding. In addition, detailed patient characterization was not possible from the data. For example, we could not determine whether patients with both asthma- and COPD-related claims should have been defined as having asthma-COPD overlap syndrome.23 Moreover, information on spacer use would have been of interest to consider. Strengths of the study include, 1) the large patient population, 2) the fact that all patients were members of an employed, commercially insured population (thus of similar socioeconomic status), and 3) the fact that the two cohorts (dose counter and non-dose-counter) were in the same insurance plan (thus affordability was likely similar for all). However, the generalizability of study findings is limited to patients receiving a first prescription for albuterol and to employed, commercially insured patients such as those who were included in the database. Further studies are needed to explore the use of integrated dose counters for other patient populations. We found that the integration of dose counters into rescue inhaler devices is associated with decreased ED visit frequency. The presence of integrated dose counters on rescue inhalers can help patients avoid using an empty or near-empty inhaler during exacerbations, thereby ensuring available medication for relief of their symptoms. The integration of dose counters on rescue MDIs could represent a simple and effective tool to improve clinical outcomes during exacerbations, with a potential for cost savings to health care systems. This study was supported financially by an unrestricted grant from Teva Pharmaceuticals, Frazer, PA, USA. The authors thank Jenny Fanstone of Fanstone Medical Communications Ltd., UK, and Elizabeth V Hillyer for medical writing support, funded by Research in Real-Life. We acknowledge with gratitude Dr Ruchir Parikh for his review of and contributions to the manuscript. All authors were involved in the conception and design or analysis and interpretation of data, as well as revising the article critically for important intellectual content. All authors have approved the final version of the article for submission and agree to be accountable for all aspects of the work. David B Price has board membership with Aerocrine, Almirall, Amgen, AstraZeneca, Boehringer Ingelheim, Chiesi, Meda, Mundipharma, Napp, Novartis, and Teva. Consultancy: Almirall, Amgen, AstraZeneca, Boehringer Ingelheim, Chiesi, GlaxoSmithKline, Meda, Mundipharma, Napp, Novartis, Pfizer, and Teva; grants/grants pending with UK National Health Service, British Lung Foundation, Aerocrine, AstraZeneca, Boehringer Ingelheim, Chiesi, Eli Lilly, GlaxoSmithKline, Meda, Merck, Mundipharma, Novartis, Orion, Pfizer, Respiratory Effectiveness Group, Takeda, Teva, and Zentiva; payments for lectures/speaking: Almirall, AstraZeneca, Boehringer Ingelheim, Chiesi, Cipla, GlaxoSmithKline, Kyorin, Meda, Merck, Mundipharma, Novartis, Pfizer, Skyepharma, Takeda, and Teva; payment for manuscript preparation: Mundipharma and Teva; patents (planned, pending or issued): AKL Ltd.; payment for the development of educational materials: GlaxoSmithKline, Novartis; stock/stock options: shares in AKL Ltd which produces phytopharmaceuticals and owns 80% of Research in Real-Life Ltd and its subsidiary social enterprise Optimum Patient Care; received payment for travel/accommodations/meeting expenses from Aerocrine, Boehringer Ingelheim, Mundipharma, Napp, Novartis, and Teva; funding for patient enrollment or completion of research: Almirall, Chiesi, Teva, and Zentiva; peer reviewer for grant committees: Medical Research Council (2014), Efficacy and Mechanism Evaluation program (2012), HTA (2014); and received unrestricted funding for investigator-initiated studies from Aerocrine, AKL Ltd, Almirall, Boehringer Ingelheim, Chiesi, Meda, Mundipharma, Napp, Novartis, Orion, Takeda, Teva, and Zentiva. Anna Rigazio was an employee of Research in Real-Life at the time of this study. Research in Real-Life conducted this study and has conducted paid research in respiratory disease on behalf of the following other organizations in the past 5 years: Aerocrine, AKL Ltd, Almirall, AstraZeneca, Boehringer Ingelheim, Chiesi, GlaxoSmithKline, Meda, Mundipharma, Napp, Novartis, Orion, Takeda, and Zentiva. Mary Buatti Small is a former employee and Thomas J Ferro is a current employee of Teva Pharmaceuticals. The authors report no other conflicts of interest in this work. Given J, Taveras H, Iverson H, Lepore M. Prospective, open-label assessment of albuterol sulfate hydrofluoroalkane metered-dose inhaler with new integrated dose counter. Allergy Asthma Proc. 2013;34(1):42–51. Wasserman RL, Sheth K, Lincourt WR, Locantore NW, Rosenzweig JC, Crim C. Real-world assessment of a metered-dose inhaler with integrated dose counter. Allergy Asthma Proc. 2006;27(6):486–492. Weinstein C, Staudinger H, Scott I, Amar NJ, LaForce C. Dose counter performance of mometasone furoate/formoterol inhalers in subjects with asthma or COPD. Respir Med. 2011;105(7):979–988. Sheth K, Wasserman RL, Lincourt WR, Locantore NW, Carranza-Rosenzweig J, Crim C. Fluticasone propionate/salmeterol hydrofluoroalkane via metered-dose inhaler with integrated dose counter: performance and patient satisfaction. Int J Clin Pract. 2006;60(10):1218–1224. Shah S, White M, Uryniak T, O’Brien CD. The functionality of a budesonide/formoterol pressurized metered-dose inhaler with an integrated actuation counter. Allergy Asthma Proc. 2010;31(1):40–48. Ogren RA, Baldwin JL, Simon RA. How patients determine when to replace their metered-dose inhalers. Ann Allergy Asthma Immunol. 1995;75(6 Pt 1):485–489. Rubin BK, Durotoye L. How do patients determine that their metered-dose inhaler is empty? Chest. 2004;126(4):1134–1137. Conner JB, Buck PO. Improving asthma management: the case for mandatory inclusion of dose counters on all rescue bronchodilators. J Asthma. 2013;50(6):658–663. LaForce C, Weinstein C, Nathan RA, Weinstein SF, Staudinger H, Meltzer EO. Patient satisfaction with a pressurized metered-dose inhaler with an integrated dose counter containing a fixed-dose mometasone furoate/formoterol combination. J Asthma. 2011;48(6):625–631. Hasegawa K, Brenner BE, Clark S, Camargo CA. Emergency department visits for acute asthma by adults who ran out of their inhaled medications. Allergy Asthma Proc. 2014;35(3):42–50. Moorman JE, Akinbami LJ, Bailey CM, et al. National surveillance of asthma: United States, 2001–2010. Vital Health Stat 3. 2012(35):1–58. Barnett SB, Nurmagambetov TA. Costs of asthma in the United States: 2002–2007. J Allergy Clin Immunol. 2011;127(1):145–152. American Lung Association. Trends in asthma morbidity and mortality, 2012. Available from: http://www.lung.org/finding-cures/our-research/trend-reports/asthma-trend-report.pdf. Accessed 12 April 2016. Ford ES, Croft JB, Mannino DM, Wheaton AG, Zhang X, Giles WH. COPD surveillance – United States, 1999–2011. Chest. 2013;144(1):284–305. Ford ES. Hospital discharges, readmissions, and ED visits for COPD or bronchiectasis among US adults: findings from the nationwide inpatient sample 2001–2012 and Nationwide Emergency Department Sample 2006–2011. Chest. 2015;147(4):989–998. Reddel HK, Taylor DR, Bateman ED, et al. An official American Thoracic Society/European Respiratory Society statement: asthma control and exacerbations: standardizing endpoints for clinical asthma trials and clinical practice. Am J Respir Crit Care Med. 2009;180(1):59–99. Bahadori K, Doyle-Waters MM, Marra C, et al. Economic burden of asthma: a systematic review. BMC Pulm Med. 2009;9:24. Hasegawa K, Tsugawa Y, Tsai CL, Brown DF, Camargo CA Jr. Frequent utilization of the emergency department for acute exacerbation of chronic obstructive pulmonary disease. Respir Res. 2014;15:40. Storms WW, Tringale M, Ferro TJ. The impact of expired and empty quick-relief asthma inhalers: The Asthma and Allergy Foundation of America’s Asthma Inhaler Design Survey. Allergy Asthma Proc. 2015;36(4):300–305. Merchant RK, Inamdar R, Quade RC. Effectiveness of population health management using the propeller health asthma platform: a randomized clinical trial. J Allergy Clin Immunol Pract. 2016;4(3):455–463. Roche N, Reddel H, Martin R, et al. Quality standards for real-world research. Focus on observational database studies of comparative effectiveness. Ann Am Thorac Soc. 2014;11(Suppl 2):S99–S104. Price D, Hillyer EV, van der Molen T. Efficacy versus effectiveness trials: informing guidelines for asthma management. Curr Opin Allergy Clin Immunol. 2013;13(1):50–57. van den Berge M, Aalbers R. The asthma-COPD overlap syndrome: how is it defined and what are its clinical implications? J Asthma Allergy. 2016;9:27–35.